Ted Sharp always had a love of aviation. Although a Navy Lt. Cmdr, he eventually found his way into the air in 1957 due to his neighbor, Harner "Doc" Selvidge, who took him for a ride in a Pratt Read at El Mirage, California. He then crewed for Doc on his 1-26 "Diamond Prospecting" flight (See article in Soaring Nov/Dec 1957 and Jan/Feb 1958). Soon he and Doc Selvidge became co-owners of a Schweizer SGU 2-22C. Ted became interested in competition and designed a scoring system in 1958 for the purpose of encouraging pilots of all levels of experience by scoring points for more than just contest achievements. He teamed with Capt. Dave Greenwood of the Air Force to form an Air Force/Navy team flying Ted's 2-22 for a west coast contest. He assisted the 1958 national competition in Bishop by utilizing his ham radio hobby to facilitate communications. 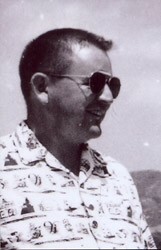 In 1959, Ted and Doc Selvidge served on the SSA seeding committee to select the U.S. Team for world competition. 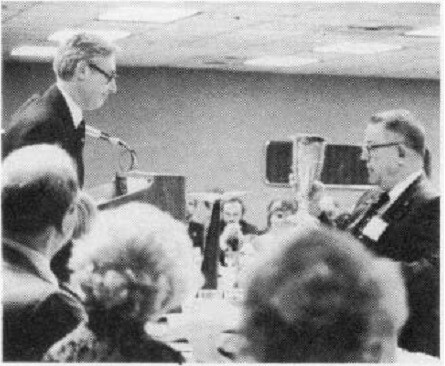 When Doc Selvidge became SSA President in 1959, he enlisted Ted's expertise to serve as Treasurer. However, Ted was assigned to sea duty after one year. When he returned three years later, he again became SSA Treasurer, serving for 26 consecutive years. Ted performed this task with distinction and was well prepared for the task, having graduated from Harvard in 1941. Ted served as editor of the SCSA publication Thermal and designed a wall calendar to raise money for the organization. 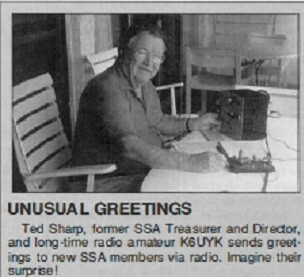 Ted also served as an SSA Trustee and invested funds for the Society from 1973 through 1995. He also became an NSM Trustee (1974 - 1995) and was Vice-President from 1974 to 1981 and then President in 1997 and 1998. He chaired the Trust Fund for the Museum from 1993 to 1995. During this time he wrote a column "Looking Backward" for Soaring magazine on behalf of the National Soaring Museum. Ted earned his Silver Badge #530 in 1961. He received the SSA Exceptional Service Award three times - in 1970, 1988 and 1995.